Contractors can have top notch ads with minimal effort. 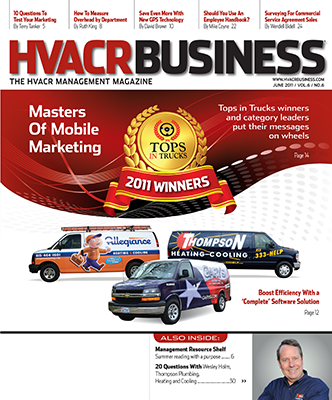 Many manufacturers, distributors, and other groups offer co-operative advertising programs to hvacr contractors. When do such programs make sense to use? 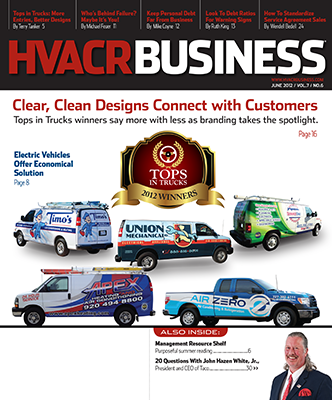 For ACE & A Heating & Cooling, Decatur, Ga., co-op programs offer an easy way to add professionalism and credibility to promotions and allow the company to advertise in ways it otherwise couldn’t afford. The 18-employee, $4-million-a-year company participates in a three-way co-op program with Ruud and a Ruud distributor. The rest of the budget pays for a variety of promotions, including co-op advertising programs. These add important elements to ACE & A’s marketing efforts, Coggins said, the first of which is name recognition. “In Atlanta, you are sitting in traffic a lot, so you reach thousands of people a day with billboards,” Coggins said. As for commercials on cable television: “It’s the repetition. When the commercial comes up, you might get just a few people calling [right away], but when they see it again, and again, and again, they’ll remember ACE & A.” Coggins not only likes having access to billboards and cable television but also appreciates the quality of the promotions and how easy it is to participate. For the television commercial, Ruud sent a professional crew to film ACE & A technicians in action at a customer’s home; and the manufacturer handles all aspects of designing and placing the billboards and designing and sending the direct-mail pieces. All Coggins had to do was email his company’s logo and some text to program managers. He was given the chance to review and approve all of the promotions, and Ruud offered ACE & A monthly payment terms during the eight-month promotion period. In these ways, the Ruud program makes ACE & A seem like a much bigger company to the public and portrays professionalism and credibility. The direct-mail portion of the co-op plan is relatively small (2,000 pieces) compared with what ACE & A mails overall, but it is a new element to the program that Coggins appreciates because it is keeping up with changes in the market. ACE & A used to service all of Atlanta, but as the city grew, and traffic became more congested, the contractor found that it was more cost-effective to have a limited service area. This made direct mail an increasingly attractive way to advertise because specific communities and income levels can be targeted. This combination of brand-name professionalism and local target marketing also works for Bryant Heating & Cooling Systems dealers in Florida who participate in that manufacturer’s co-op program through CSD Florida, an Orlando-based distributor that serves all but the panhandle region of the state as a division of Carrier Sales & Distribution. CSD customizes the co-op program by combining marketing information and tools from Bryant with local twists such as directmail campaigns targeting specific neighborhoods, and added sales incentives for dealers. According to Patrick McCarthy, CSD regional marketing manager, participation in the co-op program has been growing 15% to 18% each year for the past five years. About 225 dealers currently participate, each choosing from three options that CSD offers. The options vary in type of advertising message — for instance whether a dealer’s name will be listed alone or with a group in advertisements — but they all carry a consistent look, which is important, McCarthy said. Bryant makes it easy to have a consistent brand message with a Bryant Dealer Ad Kit, which the company updates each fall. The kit includes photos of products; pre-produced video footage for T.V. commercials; pre-produced radio spots and radio ad scripts; and other items. It also has written guidelines and advice on creating an ad budget, how to get articles published, and other topics. The kits are available through distributors or free through Bryant’s online partners intranet, said Michelle Caldwell, manager of advertising and public relations for Bryant. McCarthy said he expects the Bryant co-op program to continue to attract contractors. “They wouldn’t be doing it if they didn’t think it was helpful,” he said.